Designed to look like real Chinese takeout, these cat toys are strictly for your cat’s pleasure. Handcrafted of durable eco-felt, inside is 100% organic, U.S.-grown catnip. 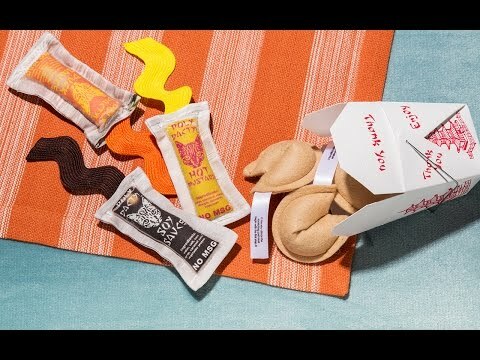 Bundled in an authentic takeout box, each "cookie" comes with a playful feline fortune. This is a great cat toy. I bought it for a friends new cat for Christmas and he wouldn't stop playing with it. The cats loved these. The box was so cute and so far they are a hit. Before I could even open the box, my cat was attacking it !! Must be some intense cat nip in there!!! My cat went crazy when I opened the bag! !